Americans are more hopeful about how well Donald Trump will perform as the president of the United States than they were during the recent election campaign. But their opinions are less positive than they were for other presidents-elect in the past. This information comes from the Pew Research Center, a Washington-based research group. Researchers spoke to over 1,500 adult Americans for the study. Pew found that 35 percent of those questioned believe Trump will be a good or great president, while 18 percent said he will be average. Thirty-eight percent said he will be poor or terrible. Pew said the opinions about Trump are far better than they were during the election campaign. Trump, a businessman, defeated former Secretary of State Hillary Clinton for the presidency. He is set to be sworn-in as America’s 45th president on January 20, 2017. According to Pew, 41 percent of Americans approved of the job Trump has done in explaining his policies and plans for his presidency. Pew said 40 percent of Americans approved of Trump’s choices to serve in his cabinet. That survey took place days before he made some of his most recent cabinet picks, including Secretary of State. Pew also said 71 percent of Americans approved of Barack Obama’s cabinet choices after his election in 2008 and before he took office. It said 58 percent approved of George W. Bush’s cabinet choices before he was sworn-in as president in 2001. People nominated to serve in the cabinet must be approved by the U.S. Senate, one of two houses of Congress. Pew’s report suggests that Trump has a long way to go to persuade Americans he is ready to be their president. According to Pew, only 37 percent of voters said that Trump is well qualified to be president. Sixty-five percent said that he is reckless and has poor judgement. Sixty-eight percent said he is not likeable. A large majority of Americans know about the election results, Pew reported. Nearly 8 in 10 voters know Trump won the most Electoral College votes. Seven in 10 know Clinton won the most individual votes in the 2016 election, Pew said. 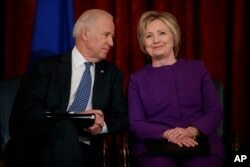 Vice President Joe Biden and former Secretary of State Hillary Clinton at the U.S. Capitol last week. When voters go to the polls, they make their choice for president. But, in reality, they are electing their state's representatives to the Electoral College. In all but two states, the candidate who wins the popular vote in a state gets all of the state’s Electoral College votes. In two states, Nebraska and Maine, some Electoral College votes are chosen based on congressional districts. In those states, the candidate who wins a majority of a congressional district gets that district’s Electoral College vote. The Electoral College will meet on Monday, December 19, to officially choose the next president. Trump is expected to become the fifth person to be elected president, while losing the popular vote. Some people opposed to Trump are urging members of the Electoral College not to vote for him as president -- even if their state’s voters gave most votes to him. But it appears the anti-Trump effort will fail. Clinton’s top political adviser is supporting calls by some members of the Electoral College to get an intelligence briefing. The members want to know more about what U.S. intelligence officials say was Russian inference with the presidential campaign. The last person elected president while losing the popular vote was Texas Governor George W. Bush. He was elected president in 2000, but lost the popular vote to then-Vice President Al Gore by over 500,000 votes. Hillary Clinton is now leading Donald Trump in the popular vote by about 2.7 million ballots, according to the Cook Political Report.